The October 16th effective date for the new Prior Express Written Consent requirements to call for solicitation purposes, any mobile device or deliver a prerecorded message using an Automated Telephone Dialing System (ATDS) is fast approaching. 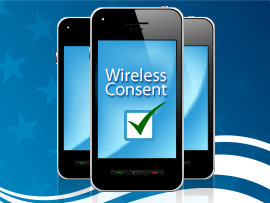 Companies that wish to obtain prior express written consent from consumers, for the purposes of placing calls to the consumer's wireless number via an ATDS or for delivering solicitous prerecorded messages, must ensure their lead sources meet specific requirements to obtain consent. Written Agreement - Consent must be obtained in a written agreement, which includes the signature of the person providing consent. An electronic signature is sufficient to effectuate a written agreement in accordance with the E-SIGN Act. Identity of the Seller- the agreement must specifically indicate the seller(s) to whom consent is being provided. Telephone Number - the agreement must include the cellular number at which the person consents to receive calls. If the written agreement includes more than one number, it must be clear for which number(s) the person is consenting to receive calls. Affirmative Action - the consumer should take some affirmative action to indicate his/her agreement. The person authorizes the seller to make telemarketing calls. The calls will be made using an ATDS (or prerecorded message, if applicable). The person is not required to provide consent as a condition of purchasing any good/services. Additionally, companies should not clutter these required disclosures with other information such as gaining consent for e-mail, mail, statements that the party agrees to the terms and conditions, and so on. We recommend presenting these new disclosures in a distinct and clearly visible manner while providing for an affirmation of agreement, such as checking a previously unchecked box. Consent can be captured when a new customer record is created, or when a customer initiates contact with a company. But these opportunities represent only a small fraction of the customer database for most large companies. For the rest, it’s important to put a plan in place to ensure compliance by October 16. Ken Sponsler, CIPP, PMP, is the Vice President & General Manager of the Direct Marketing Compliance Practice at CompliancePoint.